Claire Bothwell, 40, is hoping to use the money to fund experimental treatment. A mum-of-three fighting "incurable" bowel cancer hopes to raise £100,000 to fund experimental treatment. Claire Bothwell, 40, wants to raise awareness of the deadly illness and is calling for everyone under the age of 50 and the medical profession to be more aware of the disease's symptoms. Claire, who is based in Glasgow but is originally from Aberdeen, noticed an increase in her daily bowel movement and often found blood in her stools. 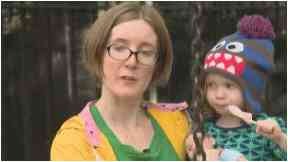 Following her shock diagnosis, she told STV: "I was completely taken aback. I didn't expect it to be cancer because I'm young and I'm healthy and that was the last thing on my mind." 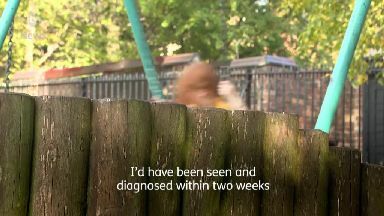 Claire was referred to a specialist, but it took five months to see a doctor. There was then another wait to obtain the diagnostic colonoscopy. After surgery to remove the tumour, tests showed the cancer had spread to her lungs. Despite nine months of chemotherapy and having five additional tumours removed, two more tumours appeared in her lungs. Claire has now been told the cancer - which is uncommon in people under 50 - may be incurable. Fighting: Claire is battling two cancers. She said: "If I'd been over 50, I would have been seen and diagnosed within two weeks and that wait has really affected my prognosis and I'm now looking at having incurable cancer and a limited lifespan. "It's devastating, you know, but you just have to pick yourself up and look for hope anywhere you can find it." Sadly, Claire has also been diagnosed with a second unrelated cancer, lymphoma. Having two different cancers excludes her from taking part in most trials, so she is going to have to pay for any experimental treatment herself. Claire's family and friends have rallied round and hope to raise the £100,000 needed via raffles, art auctions, gig and club nights, and merchandise to pay for private treatment in America or Europe. Claire added: "With the help of my friends and what they're doing for me, I am going to hopefully find, if not a cure, then something that's going to make me live long enough to see my kids grow up." For more information and to donate to Claire's cause, go to cureclairescancer.org.